A Laser Printer is an amazing feat of engineering. They use a Laser Beam to attract toner powder onto a drum which reproduces the image ready to transfer it onto the paper. Then through a series of events the image or toner gets transferred onto a piece of paper. The toner powder then gets baked onto the paper at very high temperatures resulting in a crisp image. Laser Printers are able to print extremely fast and are often used in offices where large amounts of printing is required. It all starts with either an image or some text being sent from a computer or being scanned by the Laser Printer itself. This image gets transferred to the printers processor which converts the data into an image file suitable for the printer to use. The processed image is then sent to the printers memory where it is stored ready for printing. While this is happening the drum unit is being charged ready to attract the toner powder in exact duplication as the image waiting to be printed. As the feeder pulls the paper from the paper tray, it is negatively charged by another corona wire inside a small drum unit. This makes the paper a lot more attractive to the toner than the photoreceptor drum, causing it to transfer across onto the paper. The paper continues to move along, attracting the toner powder until the full image eventually is transferred onto the paper. The process is almost finished except that the toner powder needs to be bonded to the paper so that it wont come off. 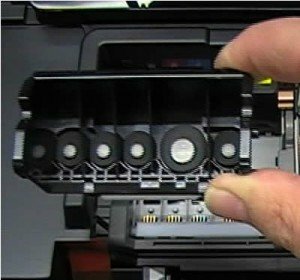 Toner does not dry like printer ink and at this stage it is only stuck to the paper because of the electrostatic charge. So the paper needs to be passed between two rollers known as the fuser unit. The fuser unit quickly heats the surface to around 200 °C which in turn melts the toner onto the page bonding it firmly in place. This is why the paper is quite warm when it first comes out of the printer. When the page of printing is finished, the photoreceptor drum resets itself with a new positive charge, the excess toner powder is cleaned off and the whole process begins again.